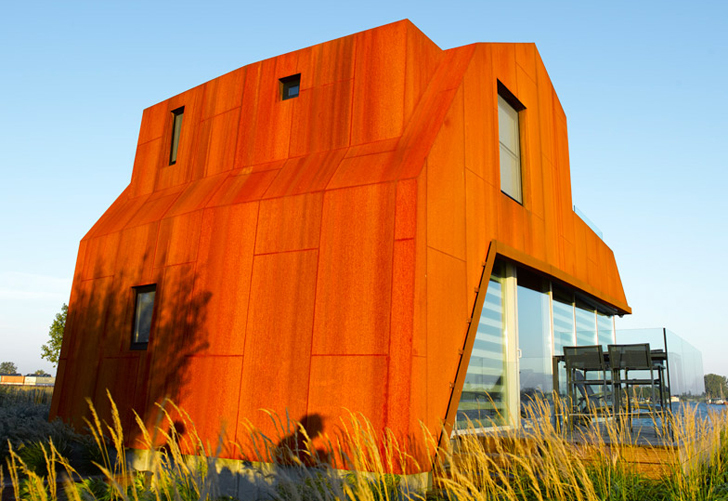 Dutch architects Tim Piët and Jos Blom designed a 240-ton holiday house that was hoisted up by the two largest cranes in the Netherlands and then transported to the banks of Pikmeer lake in Friesland. The house, named KHM26, was built off-site before it was shipped to its waterside location on a boat. Hit the jump for more details. The core of the KHM26 house was built from concrete and wrapped in a a steel shell welded into a single piece. The architects predicted the use of highly precise building techniques that would allow for the construction of a water-tight shell. Its lowest storey is set below ground level in order to function as a foundation and houses three rooms that can be used as bedrooms. Most of the ground floor accommodates an open-plan living room, dining room and kitchen, while the first floor, with its glazing, provides views of the surrounding landscape and boasts a large protected terrace. The top floor, tucked under a slanted roof, has large master bedroom with a roof terrace. By using a less conventional building technique, the architects were able to build the house with a high level of precision without having to resort of lightweight building materials. 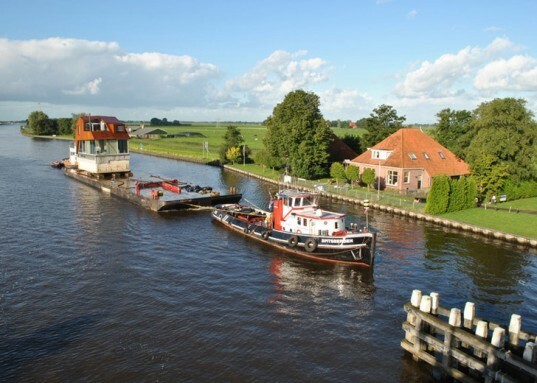 The transportation process took two days and included the use of the largest cranes in the Netherlands with a 260-ton capacity that ensure the massive home was lifted safely. The transportation process took two days and included the use of the largest cranes in the Netherlands with a 260-ton capacity that ensure the 240-ton structure was lifted safely. The core of the KHM26 house was built from concrete, with a steel shell welded into a single piece added around it. The architects predicted the use of highly precise building techniques that would allow for the construction of a water-tight shell. Its lowest storey is set below ground level in order to function as a foundation and houses three rooms that can be used as bedrooms. The top floor, tucked under a slanted roof, has a large master bedroom with a roof terrace. By using a less conventional building technique, the architects were able to build the house with a high level of precision without having to resort to lightweight building materials.